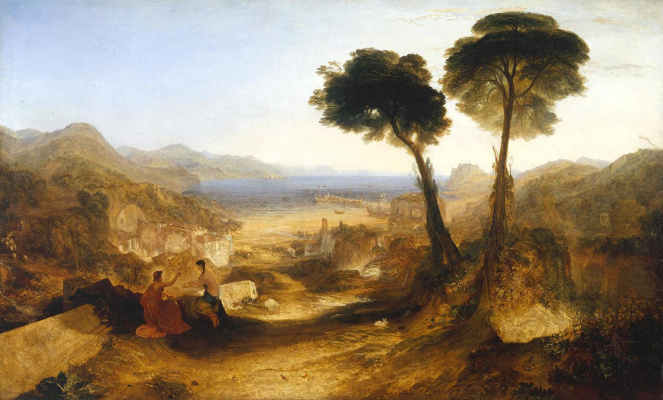 "The transition of Hannibal across the Alps" old Turner, the artist's father, loved to show visitors to their galleries, demanding to find the picture of the elephant. Did not all, and the elephant meanwhile is in the background center: where does the sky Golden light, visible to an elephant's trunk. And the elephant just Hannibal leading his army. Actually, that one moment says everything about how the lords seemed to Turner, the so-called arbiters of the destinies of man. Over there, because elephant trunk peeking out the tiny silhouette of a "Lord"... a Mighty and invincible army of Hannibal in the background of the elements is not too impressive. Obviously, before the raging nature weak, little helpless. This plot is between man and the elements (not in favor of the former) Turner addressed repeatedly. "Flying snow" depicts the events that occurred in 218 BC. 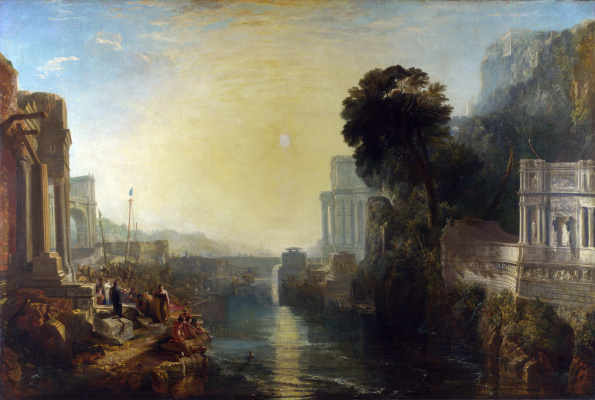 Turner liked to refer to the past in their works, not just wrote Dido, portrayed Ulysses. In this case, however, an obvious analogy to modern events. "Snow storm" was written in 1812. This year Napoleon marched to Russia, ended in his defeat. 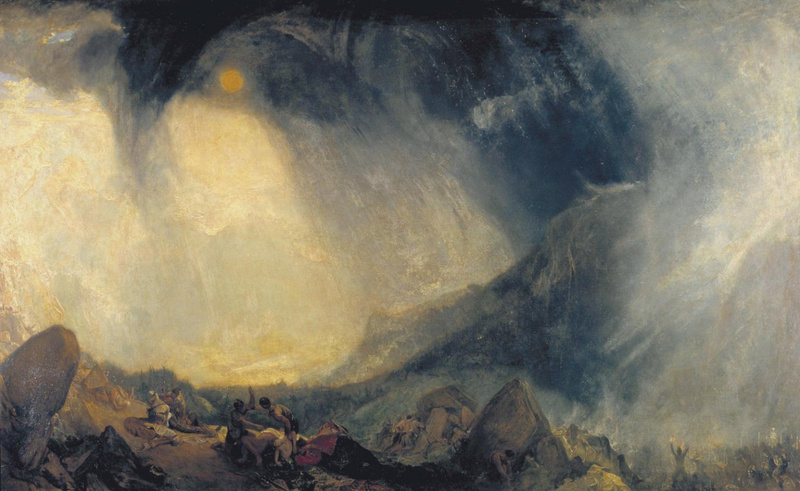 And for 10 years before Turner saw a picture of Jacques Louis David "Napoleon's transition through the St. Bernard pass" where the artist depicted the Emperor in the image of the modern Hannibal. 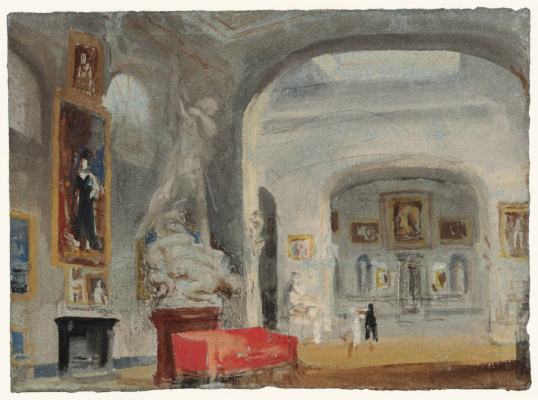 Turner loved to give the pictures a very long name, and often accompanied them with poems of his own composition. "Army Transition of Hannibal across the Alps" also attached an excerpt from his unfinished poem "Vain hope". 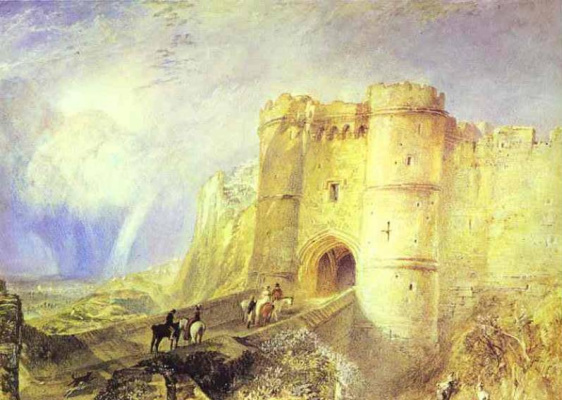 In it, Turner sang the exploits of the Carthaginians, but it was obvious that at the end of their journey – death. As we know, three years later, and Napoleon expected Waterloo. 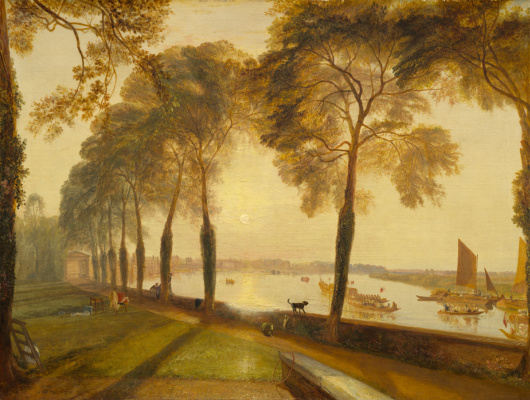 According to one version, the idea of the painting came to Turner when he visited the estate Fernly hall Walter Fox MP, landowner, collector, at whose request Turner wrote a lot. 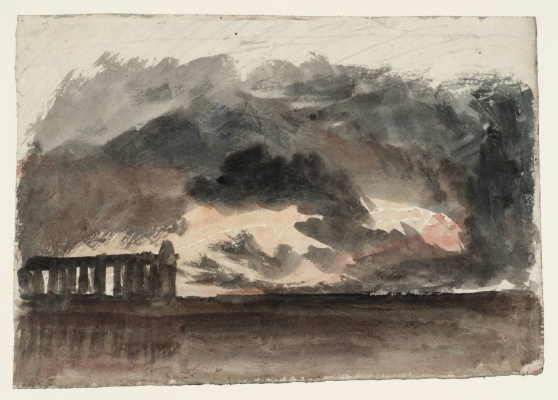 Once in the company of the son of the owner of Hoxworth Turner watched a powerful thunderstorm, rolling and sparkling over the Yorkshire hills. 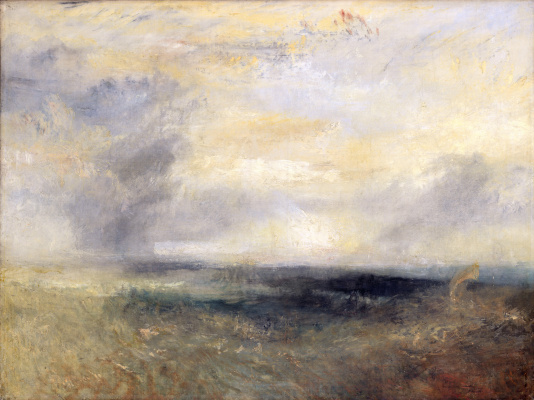 According to the memoirs of Hoxworth, Turner never took his eyes off of the raging elements, and when the storm died down, he promised: "Wait, Hokie. Two years later you see it again and call it Hannibal crossing the Alps"". 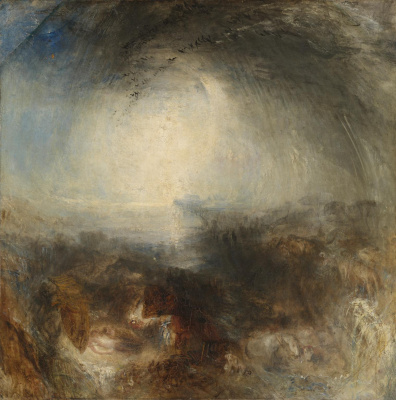 Turner presented the painting to the academic exhibition, and it created a furor. 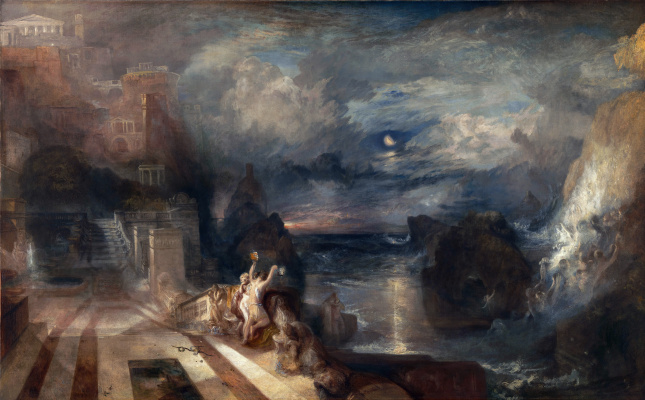 A powerful wave seemed to have swept not only the army of Hannibal, but critics, because the most modest estimate of the work was "the best painting in the exhibition" but have heard such definitions as "the most amazing scenery that was created in this world" and "a true masterpiece".